I came to an event to check out the space. I was surprised by what I found. As an artist, I’m always on the lookout for interesting places to show my work or to host events in the years to come. I’ve always wanted to visit A/D/O, a trendy event space (owned by MINI) in Brooklyn. One of the artists I admire had a massive sculpture installed there this past summer. Since then, I’ve been on the lookout for an excuse to visit the space, trusting that the right event would come in due time. A few weeks ago, I met a guy at a cafe who mentioned the space, which reminded me to check out the website. I found a seminar series on Design and Research. The next event? “Pray for Me: On Religion and Spiritual Fictions,” the last event of the year for that series. Intrigued, I bought a ticket. The event was more glam than I expected. Red velvet curtains and candles along an industrial chic stage – very Madonna. Coupled with smoke machines for an other-worldly look, this was way more of a production than you’d ever see in SF for a panel on a Monday night. Happy to note the look and feel of the space, I had accomplished my mission for the night. Then the panel started. The panel, moderated by an egregious French lady, included a hipster Christian pastor, an academic, an architect of religious spaces, and a software engineer. Over the past three years, I’ve been poking my head into more creative communities than I can count. Like the Ugly Duckling searching for its mother, I’ve been implicitly asking of each group, “Are you my people?” As I’ve become clearer on who I am – and as my Inner Compass has gotten stronger – it’s easier for me to tell. As soon as the panel began, I *knew* I had found my people. The audience, the panelists. The questions, the stakes. The panelists (especially the pastor and the academic) for a hot second inspired me to go to graduate school, perhaps to study philosophy, history, and world religions. Of all the conferences, conference rooms, book signings, poetry readings, art openings, art classes, talks, retreats, workshops, eye gazing, holding hands in circles with strangers, Bali, and even Burning Man.... what was different this time? So clearly recognizing that my interests are not just in creativity and personal growth, but also in the big “s-word”: spirituality. I walked home that crisp November night, chilly yet feeling fully seen. I go to a yoga studio in Soho founded by a super rad Israeli couple. You can hang out in the lobby between classes. 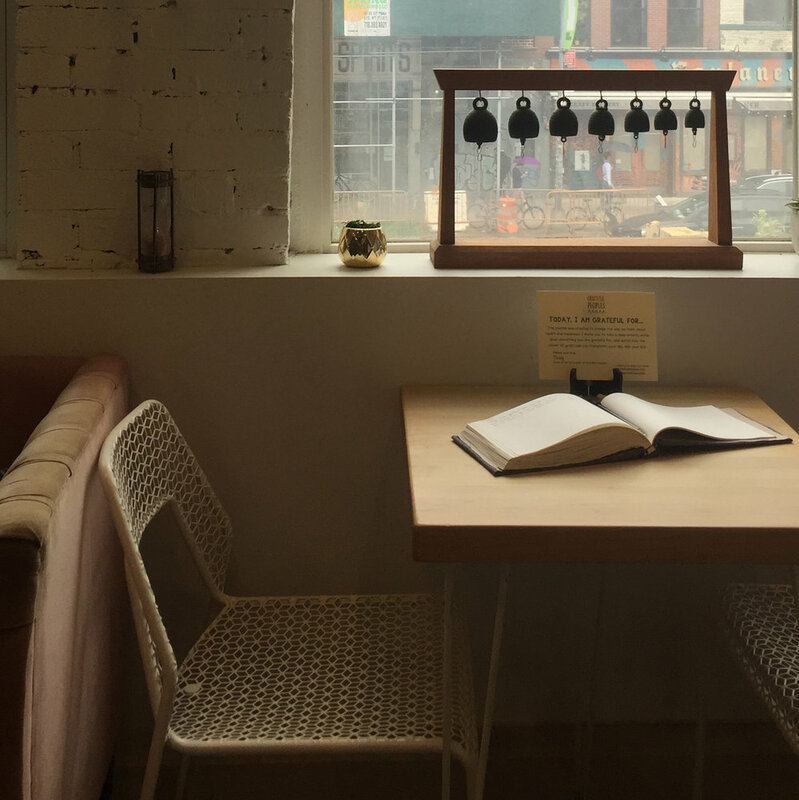 With a café and a small library, it’s a nice respite between errands in the neighborhood. One of the co-founders, David, and I have had some interesting conversations over the past few months. One Sunday afternoon, I’m hanging out there. "Hey, I'm heading out for a bit," I say to David. "See you in class in an hour." "Are you going to Whole Foods?" he asks, referring to the one across the street. "If so, can you please grab something for me?" I pause. Me at 28 would’ve just done it without saying anything. Me at 31 reluctantly says, "Actually, I'm going to church around the corner." I launch into a lengthy explanation about my spiritual practices and my understanding of the historical light and shadows of the Catholic Church. I exhale, surprised and relieved. “Of course.” I smile back and laugh, slinging my backpack over my shoulder as I head out.